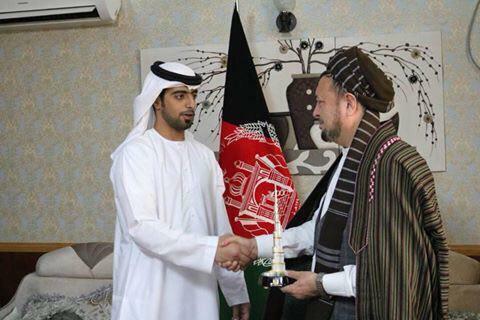 The press office of the second deputy to the Executive Directorate of Afghanistan said that the acting head of the UAE embassy Isa al-Mazrui met with Mohammad Mohaqiq, the second deputy to the executive directorate on Sunday. During the meeting, the acting head of the UAE embassy al- Mazrui said that his country is seeking to strengthen relations with the Islamic Republic of Afghanistan and collaborate with Kabul in various development areas. Mr al-Mazrui said in his visit that the opinions and consultations of the second deputy to the Executive Directorate in the fields of politics, economy, and development programs are useful for his country. He condemned all terrorist activities in Afghanistan and wished Afghanistan to reach peace and stability in the near future. Mohammad Mohaqiq said such meetings will strengthen and expand relations between the two countries and thanked the UAE for cooperation in various sectors in Afghanistan. The second deputy to the Executive Directorate further said the UAE’s efforts in the fields of economy and business are important for the people of Afghanistan and asked the acting head of the UAE embassy to pay more attention in this regard. The UAE has had many investing programs in Afghanistan.